New one from Bex find it in my very productive place. The needles are clicking, the jumpers keep rolling out. Bexknitwear keeps going from strength to strength. What do you do when you’re ready to sit down in your crafting area, and you don’t have a single craft idea?! Sometimes we want to make something, but we’re just not having a creative day. Where can we get a new craft idea to encourage the creative juices to start flowing again? Knitting is a great hobby. Many people enjoy knitting because of its many benefits. Knitting is considered as a form of art. A completed piece of knitted item is in fact the creation of a piece of art. Bold stripes of red and black is a great sweater for that cool retro look. 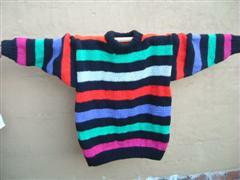 A chunky sweater knitted in acrylic, for a wash and wear, time after time and still looks great. 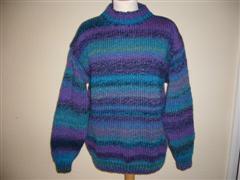 Can be knitted in any size from extra, extra large to very small and in any colour. Choose your stripes to be thick thin or medium.